Whenever you have a balance on your credit card, you're required to make monthly payments toward the balance. Each monthly payment must be made by a certain date determined by your credit card issuer. This date is your payment due date. Unless your credit card issuer states otherwise, your payment must be received by 5 pm on the due date or you’ll face late payment penalties. Some credit card issuers may extend the payment cut off time to as late as midnight. Check with your credit card issuer to find out the exact time that your payment must be made. Don't forget to consider the time zone for the payment cut off time. You can make your credit card payment before the due date with no penalty. Be careful that you don't make the payment too early. Otherwise, the payment could be applied during the wrong billing cycle. You can also make more than one credit card payment each month as long as the minimum payment is made on or before the payment due date. You can find your payment due date printed on your monthly billing statement. If you’ve misplaced your statement and need to know your due date, log in to your online bank or call your credit card's customer service to find out the due date and the minimum payment amount due. Writing your payment due dates on a calendar can help you keep up with them so you don't miss your payment and have to deal with late payment penalties. If the payment due date falls on a weekend or holiday (or any other day the card issuer doesn’t accept payments) then a payment made on the following business day is considered on time. However, since most credit card issuers accept automated payments online and by phone, your credit card is typically due on the payment due date no matter on which day it falls. If you typically mail your credit card payments, you should send your payment in advance of the due date to account for weekends, holidays, or delivery delays. If you miss your due date on a credit card or loan, you’ll face late payment penalties. These can include a late payment fee and interest rate increase. With rewards credit cards, you might forfeit your credit card rewards if you miss just one payment due date, depending on the terms of your rewards program. Unfortunately, making up your payment won't reinstate the rewards you lost, and you'll have to start over again. You can make your payment plus the late fee as soon as you realize you've missed your payment. In some circumstances, the credit card issuer may be willing to waive the late fee, particularly if it's the first time you've been late on that payment. 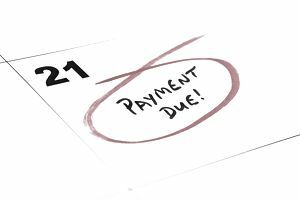 Don't wait until your next payment due date to make up the missed payment. By that time, you'll be at least 30 days late and the late payment will go on your credit report, damaging your credit rating. Your credit card payment due date will fall on the same date each month. For example, if your credit card payment is due on the 10th of this month, it will be due on the 10th of every month. Most credit card issuers allow you to change your due date to another date during the month. Look over your paydays and the timing of your other bills to select a better due date, then call your credit card issuer to have the due date changed. Confirm the due date change on your next billing statement and update your calendar to ensure future payments are made on time.